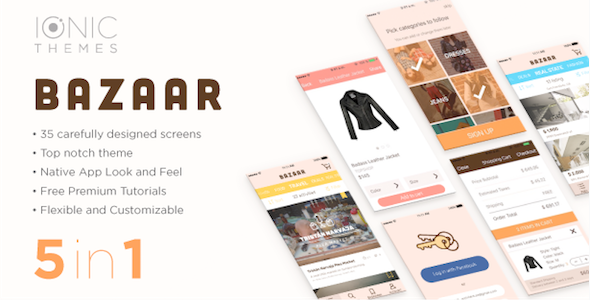 BAZAAR includes more than 35 carefully designed screens. This is a multipurpose mobile template with tons of features and functionalities, built with AngularJS and Ionic Framework which gives you the bootstrap you need in order to build your next mobile app. Note that this Template can be used for many purposes for example: listing apps, social apps, ecommerce apps or just any app you can imagine. Note: There is no backend attached to the login, it’s just visual. We then will be happy to answer all the app related questions/issues. You can build this app with phonegap build, however, we don’t provide support on how to build the app using phonegap build.